Amazing new construction high end 5 bedroom 6 bath home on private-island fractional home. Your own private island with unique designed compound home specifically laid out to take advantage of the amazing sea and mountain views and the cool trade winds right off the Placencia Peninsula in Southern Belize. 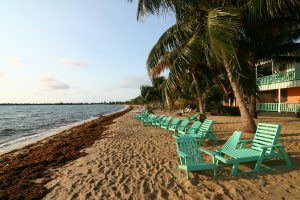 Little Harvest Caye island (LHC) is a 1.5 acre island that is located just 3/4 of a mile from the center of Placencia Village. The island home was completed in January of 2016. The island is uniquely situated to have panoramic views in all directions of the Maya Mountains, open ocean, Placencia Village and Harvest Caye located 3 miles away from where Norwegian Cruise Lines is constructing a 20 million dollar destination resort island for its guests. Owners truly have the best of both worlds with all the features and privacy of a private island yet all the conveniences of being close to Placencia Village. Owners get to enjoy the high end luxury features of LHC like full time professional staff and chef, private air conditioned bedrooms, large custom pool, white sand beach in crystal clear water, large thatched living area with all custom local wood work and can jump in their private boat and in just a few minutes be in the center of the village to go to the store, have dinner at one of the many local fine restaurants, have a drink at one of the many bars, etc. 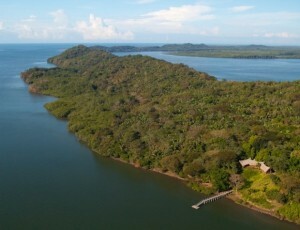 This is a unique and proven investment opportunity to acquire an ownership interest in a beautiful, secluded private island home without all the hassle and expenses typically associated with second home ownership. Our proven model allows owners the ability to own and use a unique luxury home and rent out the weeks they do not want to use to make a nice return on their investment. This is the perfect investment opportunity for someone looking for an upscale, first class, large, private island 2nd home that wants a place to truly call their own but does not want the expense and full time headache to maintain. Owners also have the option to use open weeks in calendar for last minute use at no cost. LHC like its sister properties in the Vision Properties portfolio: Villa Tipsy Gecko, Villa Groovy Gecko, Villa Jammin Gecko located on the Placencia Peninsula and will be sold in 1/10 fractional shares. The other 3 properties have been very successful with a proven track record, exceptional rental history and a cohesive group of owners all of which has led to the available shares in those properties selling out fast! To date the LHC rentals have been even better than expected you can see the rental site and how booked the calendar is already on VRBO.com listing number 758309. Also our other homes information on the Peninsula can be found on the VRBO rental site, listings number 502818, 286157, and 663419. Please read the numerous reviews on such listings posted by prior guests to get a good idea on the three properties amenities and service levels. LHC is fully furnished with high end décor and finish out both inside and out, complete with all the features and amenities that you would expect in a multi-million dollar plus home in the states PLUS, detached staff house with excellent experienced staff including chef, personal boat, and gas golf cart (located at island launch in Placencia). Home Description and Details: Main Living Area, Bar & Kitchen Massive open air main living area, kitchen and bar with soring custom thatch roof and elegant woodwork… This area will have a large full walk around bar, eat in kitchen and private study. The living area is overlooking the pool and the sandy white beach complete with amazing views of the Maya Mountains. The pool is a large freshwater, concrete pool with tanning ledge and layout deck. Master Bedroom and Bath This huge private bathroom will have a large covered private balcony, large open closets, and a make-up vanity/desk. The bathroom is a separate private room with thatch ceiling, concrete counter tops with his and her sinks, free standing tub, walk in shower as well as separate large outdoor shower. Bedroom 2 & 3 and Associated Baths These large private bedrooms will share one common wall, each with a private covered patio and ocean views. Each bedroom has its own private bath that is a separate room with thatch roof, Onyx sink, concrete counter tops and walk in shower. Bedroom 4 and Bath This large private bedroom will have a private covered patio with beautiful ocean views. This unit is complete with a private bath in a separate room with thatch roof, Onyx sink, concrete counter tops and walk in shower. Bedroom 5 and Bath This large private bedroom will have a private covered patio with beautiful ocean views. This unit also has a complete private bath with a walk in shower as well as separate large outdoor shower. Please note that all bedrooms have their own high-end inverter technology mini split A/C system that are the quietest and most efficient systems on the market. The bedrooms and bathrooms will also have ceiling fans powered by DC motors to ensure a comfortable nights rest while still being energy efficient. All bathrooms, except in bedroom 5, are open air with a gap below the thatch roof-line to allow for the cool breeze without sacrificing privacy. Why we picked Placencia? 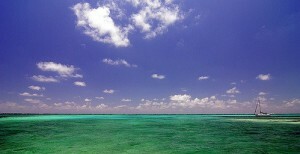 It has some of the best beaches in Belize. It is set for rapid tourism and growth. Placencia has options multiply options. Beach one day and Jungle the next. Activities in Placencia: Mayan Ruins, Cave Tubing, Water Falls, Hiking, Zip Lines, Saltwater Fly Fishing, Snorkeling, Diving, Jungle Tours Information of Ownership: Owners usage is governed by a very well drafted usage agreement that assigns weeks of usage on a rotating annual basis that has been proven to work very. Owners have the flexibility to use the 5 weeks they select or rent them out via the homes rental web sites. To date (and for 2015) all owners in the other Vision Properties Gecko homes have been able to pick the first two weeks of their usage without any conflicts, etc. with other owners. Vision Properties would expect that to continue in the future as current owner usage is limited and spread out through the entire year. What we do not want is a timeshare sort of system with high management fees and expenses. Island has full time experienced care taker and chef that lives on site (check out reviews on VRBO sites) that performs all maintenance on property, and is full time concierge when owners or guest are at home. There are NO MANAGEMENT FEES and expenses are simply what it cost to provide basic utilities, hurricane and casualty insurance and to maintain the property, and boat to a high level that all owners would expect and demand. THIS IS A HUGE DIFFERENCE FROM WHAT TYPICALLY OFFERED IN FRACTIONAL PROPERTIES. Owners TRULY control the management and operation of the property!! 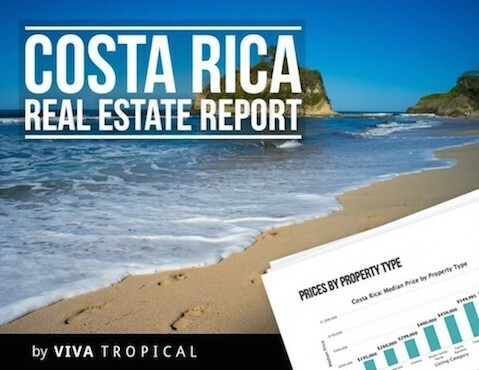 Underlying value of the private island (which is equal to the combined sales price of all shares) and a proven model for returns from other Vision Properties rental income makes this a very solid investment that can be used and enjoyed by owners. Seller also builds homes in area and if down the road a buyer decides they want to live full time in Placencia or have a 100% owned vacation home, Seller will take share of home in on trade for the construction of a new home. This unique offer allows an owner in the home to get to really get to know and enjoy Belize now while making a nice return on their investment to be used towards the purchase of a full time residence in the future. Additional photos of area, finished homes next door as well as a detailed Q&A that answers most every question we have heard over the past years are available to send out via email. Please call or email with any questions about the home, the concept, how to arrange a visit to Belize to see home and Placencia, financing terms, etc.